Steaming Suwannee River on a frosty morning, as viewed from the bath-house at White Springs, Florida. White Springs, Florida has one. West Virginia has one too. Florida's White Sulphur Spring has dried up (the aquifer has been drawn down--too many wells) and the once thriving resort town is in decline. West Virginia's White Sulphur Spring is still flowing - as far as I know - and its resort has become a major upscale destination - the Greenbrier. People go to White Sulphur Springs, WV to escape the summer heat and play golf. 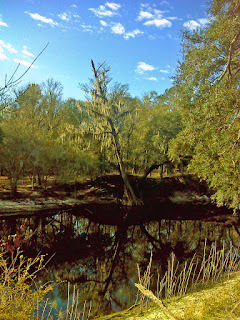 People go to White Springs, FL to escape the winter cold and to hike along the Suwannee River. It's winter. I'm hiking. I'm at the right White Sulphur Spring! To be fair, White Springs, FL is no dreary, destitute place. It impressed me as a clean, friendly town. The spring may be little more than a historic curiosity, but there's also the Stephen Foster Folk Culture State Park with its world class carillon and extensive gardens. The Florida Trail goes through the heart of town on a sidewalk and runs through the park for four miles along the Suwannee River. White Springs, FL was one of the Florida Trail's first official trail towns. If you don't hike, there's river boating and swimming, and on the east side of town the trail passes through a popular off-road bicycling area. And here's a tree whose trunk is split in two - 'see-through tree'. I hiked only nine miles today, opting to finish early partly for logistical reasons and partly because yesterday's 1000 feet of up-and-down scrambling and sixteen miles of horizontal hiking had left me a little sore. But there might be a third reason. 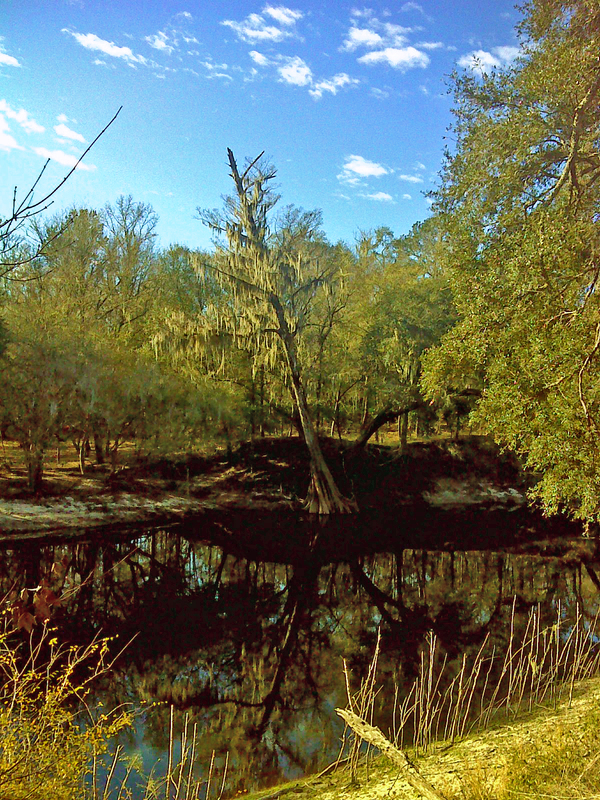 I only have a few more miles to hike along the steep banks of the Suwannee. I don't want it to end, so maybe subconsciously I was trying to linger, to dawdle, to make it last a little longer. Here's the map of today's hike with links to more photos.